New at Young’s is Monday Night Trivia every Monday at 7pm! 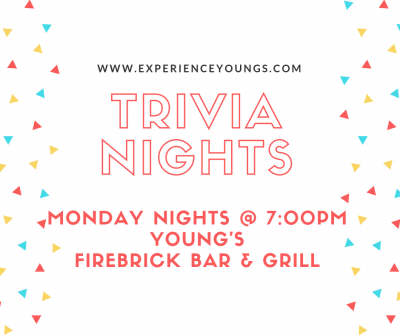 Starting October 15th stop by every Monday night for food and drinks from FireBrick while you try your best to answer 50 questions selected by one of Young’s very own FireBrick Chefs, Mike Mitchell. You can play as a single or a team. Prizes available for 1st and 2nd place winners.